Present state: Demolished - the Docklands Light Railway now runs through the station site. The only evidence of the station is in Harrow Lane from where a long footbridge across Harrow Lane marshalling yard was the only access to the station. A section of brick wall is clearly newer than the rest of the wall, this was the entrance to the station. 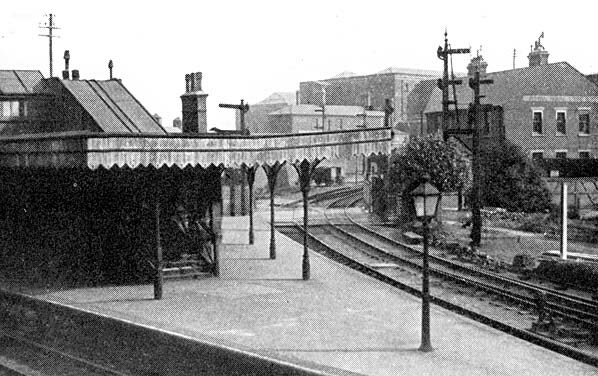 The station closed to passengers on 4th May 1926 but remained open for freight traffic until 14th November 1927. The last passenger train to stop at Millwall Junction Station was the RCTS Northern Heights Railtour on 1st October 1960. It ran from Fenchurch Street to Poplar via the Limehouse curve. Reversing to Millwall Junction it then took the North London Line to Camden Road and Edgware eventually terminating at Stratford. Connections into the docks at Millwall Junction remained in use until the early 1960's. The track through the station remained in use as a siding until the late 1960's and although this track was lifted during in c.1977 part of the extensive sidings to the north of the station were in use until at least 1981 and the remaining tracks were lifted in c.1983. 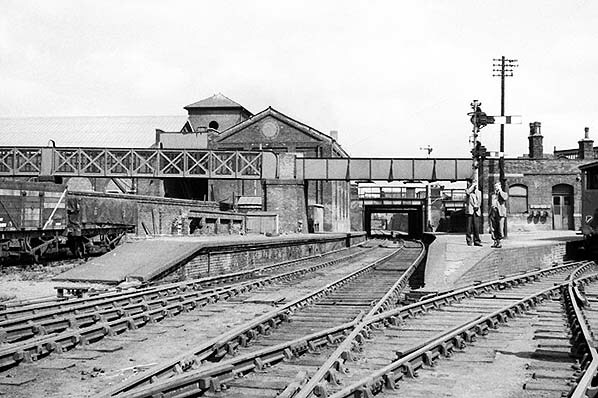 The station buildings were demolished in 1965 but the platforms remained into the 1980s and were finally removed during the construction of the Docklands Light Railway. The London & Blackwall Railway was one of London's earliest railways and was unusual in that it was operated by cable haulage for the first nine years. Initially two companies proposed a rail link from the City to the docks and residential developments along the north bank of the Thames. George Stephenson's Commercial Railway received Parliamentary sanction to build the line on the 28th July 1836 and in 1839 subsequently changed its name to the London & Blackwall Railway. Despite opposition from the Corporation of London, a terminus at Fenchurch Street was eventually approved. At the Blackwall end of the line a station and adjacent pier (Brunswick Wharf) were to be built on land owned by the East & West India Dock; by this time the company had changed its name to the London & Blackwall Railway. As there were no plans for a direct connection with any other lines the L & B opted for cable haulage with a gauge of about 5' (exact gauge not recorded). Although the route was only 3 1/2 miles long six intermediate stations were proposed at Minories, Shadwell, Stepney, Limehouse, West India Dock and Poplar with a further short lived station at Cannon Street Road opening in 1842 (it closed four years later). From Minories to West India Dock the line was carried on a brick viaduct which then gave way to an embankment with the line eventually completed its journey through Poplar in a cutting. The engines to drive the cable winding gear were located a short distance from each of the terminals, at Minories at the London end and about 350 yards from the Blackwall terminus. From the cable houses there was an upwards gradient to slow down arriving trains and enable departing trains to run to the winding station under their own impetus. Each of the two tracks had its own hemp rope some seven miles in length. The Blackwall Railway opened on 6th July 1840 when the first of the two lines between Minories and Blackwall was opened with the second track coming into use on 3rd August providing a 15 minute interval service. Passenger numbers were however disappointing; it was hoped that this would improve when the extension into Fenchurch Street was opened on 2nd August 1841 but there was little change. There were teething problems with the ropes which regularly broke and in 1841 new wire ropes were fitted but they were over twice the weight. From the outset, the hopes of the railway company had been largely founded on capturing passenger traffic from horse busses and river carriers. In 1841 a ferry from Woolwich - Brunswick Wharf was introduced which brought an immediate increase in passenger receipts as, at that time, Woolwich had no rail connection into the City but this gradually eroded as the expansion of the rail network south of the river soon brought a more convenient route into London. The wharf was not confined to local journeys with steamers serving towns along the Kent coast with other services crossing the Channel to Antwerp and Rotterdam. The L & B eventually sought new partners to increase revenue with several schemes being promoted. The East & West India Docks & Birmingham Junction Railway (later to become the North London Railway) proposed a line from the L & NWR at Camden to Poplar and eventually it was decided that this should run into the Fenchurch Street terminus via a connection at Bow. 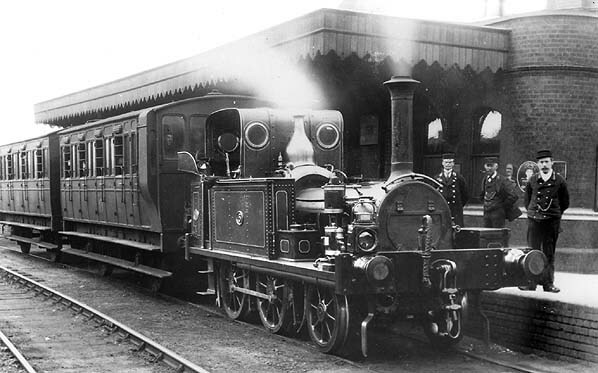 This scheme required a change of gauge and conversion to steam haulage for the L & B and the extension from Stepney - Bow opened on 2nd April 1849.. By the beginning of 1854 the Eastern Counties Railway were running trains into the City terminus from their Enfield, Hertford and Brentwood lines; the two companies jointly established the London, Tilbury & Southend Railway which opened on the 13th April 1854. The L & B continued to expand with some Eastern Counties trains on their North Woolwich line running into an enlarged Blackwall terminus. A third line between Stepney and Fenchurch Street was added after completion of a connection with the Tilbury line at Barking, this opened on 31st March 1858 allowing Tilbury & Southend trains to run directly into Fenchurch Street which was preferred by the ECR due the limited accommodation at their own Bishopsgate terminus. This continued until the opening of Liverpool Street in 1874. Developments on the revitalised Blackwall Railway were not confined to passenger traffic. In 1852 a junction was constructed at Poplar between the North London line and the L. & B. which was used for traffic between the former and the East India Dock. 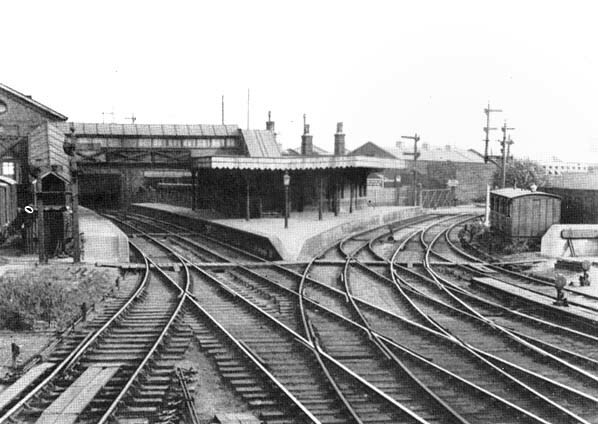 To further accommodate freight traffic a short branch was opened to Haydon Square at the City end of the line. In 1858 a goods depot named Royal Mint Street opened on the site of Minories Station which had closed in 1853 and the Midland Railway's City Goods was also opened nearby. In 1861 a new depot (Goodmans Yard) was built for ECR, LTS and Blackwall traffic on the north side of the line just outside Fenchurch Street. Finally in 1864 a short branch was opened to serve the London and St. Katherines Docks. There is no doubt that the decision by the London & Blackwall Railway to abandon cable haulage in favour of conventional locomotive working was the right one and this was reflected in the company's dividends which, by 1862, had risen to a steady 3%. In 1865 a Parliamentary Act approved the lease of the Blackwall line to the newly-formed Great Eastern Railway. The importance of Fenchurch Street to the GER ensured a good price for the Blackwall shareholders who continued to receive a guarantee dividend of 4 1/2% until the line became part of the LNER in 1923. On 19th June 1865 the London & Blackwall Company obtained an Act that authorised the building a line from a junction with the London & Blackwall at what was to become Millwall Junction Station across the Isle of Dogs to a terminus at North Greenwich. Progress on the line was slow opening as far as Millwall Dock Station on the 18th December 1871 and reaching North Greenwich on the 29th July 1872. Although the North London Railway had originally been the Blackwall Company's main partner so far as passenger traffic was concerned, as more Eastern Counties, and later Great Eastern, trains came to use Fenchurch Street, the North London traffic had diminished in relative importance. This feature may well have influenced the North London Company in its decision to build their own terminus at Broad Street which opened on 1st November 1865 but to compensate for loss of traffic the North London extended their Poplar service to Blackwall on the 1st September 1868, this was however short lived as the service was cut back to Poplar again in 1890. In 1872 new stations opened at Leman Street and Millwall Junction and in 1893 approval was granted for a further widening of the busiest section of the line between Fenchurch Street and Stepney to four tracks. The GER attempted to buy the Blackwall line outright in 1898 but this was rejected. Soon after the turn of the century the tide began to turn against the railway's passenger traffic to Blackwall. Much of the steamer traffic on the Thames had succumbed to railway competition and already people were moving further out of London to live. In 1907, the Blackwall line service was reduced to three trains an hour, and in the October of the following year Sunday services were discontinued. The number of passengers using the line east of Stepney continued to diminish and closure came on the 3rd May 1926, at the time of the General Strike. By this date the old London & Blackwall Railway had ceased to exist, being absorbed in the London & North Eastern Railway as part of the grouping resulting from the Railways Act of 1921. The section of the original Blackwall line between Fenchurch Street and Stepney was not affected by the 1926 closure and continued to carry a heavy volume of traffic. The intermediate stations, which had platforms only on the original pair of tracks, were closed in 1941 but this portion of the line is today intensively used by the electrified service to Southend and Tilbury and the later Dockland Light Railway. Freight traffic continued on the Blackwall route and Millwall Junction Station remained open for freight traffic until 14th November 1927. The line remained in use for freight particularly via Limehouse curve with many trains carrying Elder & Fyfe banana traffic from their facility on the south side of the East India Docks. The first section of track to be lifted was at the Blackwall end where the station was demolished in 1946 to make way for Brunswick power station. The last train between Stepney Junction and Limehouse was an enthusiasts special on 14th April 1951. After that date the points at the west end were disconnected with access to the Blackwall line remaining via the Limehouse Curve. 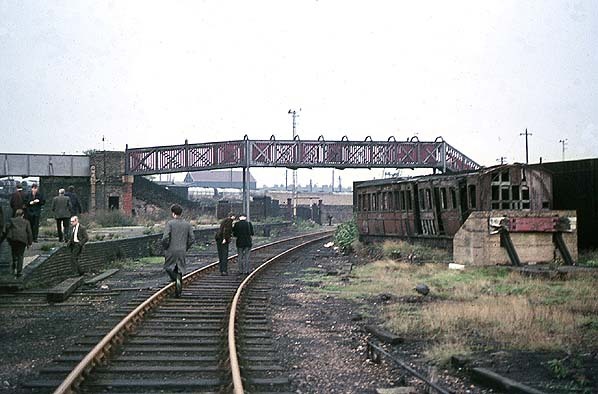 The curve was abandoned on 10th May 1963 leaving the only access via the North London line at Poplar. This remained in use until at least 1976 but by the early 1980's all the track had been lifted. In December 1982 Government approval was given for the Docklands Light Railway which would utilise the London & Blackwall line between Minories and Poplar. The DLR opened on 31st August 1987; the remaining section of line through Millwall Junction was lost under a new road development in the early 1990’s which opened in 1993 as Aspen Way. In 1863, the London and Blackwall Railway Company proposed a line across the Isle of Dogs from a junction at Limehouse. The proposed route would cross the western entrances to the West India Docks running south to serve new industries at Millwall, terminating on the north bank of the Thames at Cubitt Town from where there was a ferry to Greenwich. The proposed line was vigorously opposed by the East and West India Dock Company and rejected by Parliament in 1864 because of the adverse effect it would have on the docks. The Great Eastern Railway took a long lease on the London & Blackwall line in 1864 and revived the scheme for a branch line across the Isle of Dogs following the successful Bill for the construction of the Millwall Docks. The East and West India Dock Company were still reluctant to allow the railway to pass through their estate and suggested an alternative route across the east side of the West India Docks, where there was already a siding. A further Bill was submitted to Parliament and the railway companies were forced to amend their proposals to accommodate the dock company, agreeing to build either a tunnel under the docks or a line on their east side, which the dock company would build and control with the right to exclude passengers and locomotives, to reduce fire risks. The Millwall Extension Railway Bill was passed on 19 June 1865 but apart from the junction with the Blackwall line at Poplar, nothing was done as a number of factories that the line was intending to serve went out of business following the financial crash of 1866. The GER lost interest in the line and the raising of capital was left to the London and Blackwall company, The Millwall Freehold Land and the Docks Company. The rebuilding of the South Dock of the West India Docks from 1867 rendered the tunnel option impracticable. Finance was finally secured in May 1868 and it was agreed that the London & Blackwall would build the first 5 chains of the line from the junction at Poplar to the West India Dock estate boundary. The dock companies would build and finance the sections of line on their own property, 41 chains through land owned by the East & West India Dock Company and 52 chains along the eastern edge of the Millwall Dock estate. The final 31 chains was built by the London & Blackwall making a total length of 1 mile 49 chains. The branch was laid with light rails opening on 18th December 1871 between a new junction station on the London & Blackwall line called Millwall Junction and Millwall Docks station with an intermediate station at South Dock within the East & West India Docks. This section of the line opened for freight and a workmen's service was also provided. Work on the remainder of the single track line started early the following year opening to North Greenwich with a full passenger service on the 29th July 1872. The terminus was actually in the new working class residential district of Cubitt Town but the GER chose the more 'up market' North Greenwich for the terminus which was sited 200 yards from the jetty served by the Greenwich ferry. 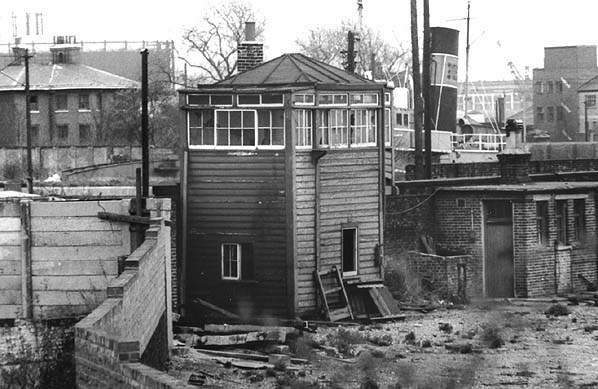 The main civil engineering features of the line were three swing bridges and a brick arched viaduct between Millwall Dock station and North Greenwich. Initially steam traction was not allowed through the docks because of the weak timber and the close proximity of wood yards. Initially, tram cars were horse drawn between Millwall Junction and the southern boundary of the Millwall Docks from where a steam locomotive hauled the cars to the terminus at North Greenwich. The GER built a new pier at North Greenwich and in 1974 ancient rights to carry passengers were transferred to the GER with through tickets to South Greenwich available from Fenchurch Street. This service continued until the London County Council opened a pedestrian subway under the river at Greenwich on 4th August 1902. With the opening of this tunnel the GER agreed to withdraw the ferry service from 31st October after receiving £8,000 in compensation. Through locomotive haulage on the branch finally started on the 23rd August 1880 after bridges had been strengthened and three small 2-4-0 ST locomotives had been acquired. At this time, the working of the branch was taken over by the Millwall Dock Company with a 15-minute service from 7 a.m. In November 1922, the Port of London Authority, as successor to the dock companies after 1909 replaced the existing steam engines which ex-GWR rail motors and to facilitate these, a number of bridges had to be further strengthened. The line had never proved popular with passengers and had been steadily in decline except when Millwall Rovers Football club were playing at home, on these days the tiny locomotives often pulled five crowded coaches. This seasonal traffic was however lost when the club moved south of the river to New Cross in 1910. During WW1 the service was reduced to two trains an hour and with many of the passengers lost to motor busses closure was inevitable and was announced for 30th June 1926. This was, however, pre-empted on 4th May 1926 when locomotive crews were stopped by pickets during the General Strike and the service was never reinstated. Freight traffic continued over part of the route until 1929 but the line between North Greenwich and Glengall Road was completely closed and part of the viaduct was demolished in c.1936. In December 1982 Government approval was given for the Docklands Light Railway which would utilise the London & Blackwall line between Minories and Poplar. The DLR opened on 31st August 1987. Initially the DLR consisted of three branches with their termini at Tower Gateway, Stratford and Island Gardens. The Island Gardens branch turned south at Poplar running through the Canary Wharf development joining the old North Greenwich alignment at Crossharbour close to the site of the old Millwall Docks Station from where to DLR followed the course of the Millwall Extension Railway across the Millwall viaduct to Island Gardens which was built roughly on the site of the former North Greenwich terminus. Shortly after the DLR opened, Lewisham Council commissioned a feasibility study of extending the DLR under the Thames to Lewisham. The line was eventually authorised, its proposed alignment left the original DLR route south of Crossharbour dropping down to a new a street level station at Mudchute, from where the new line would be built by cut and cover through Millwall Park to a new sub-surface station at Island Gardens, just east of the southern end of the Millwall viaduct. From there the line would tunnel under the Thames and on to Lewisham. Mudchute and Island Gardens stations closed on 11th January 1999 and the Lewisham extension opened on 20th November 1999, the Millwall viaduct having lost its train service for the second time. It can still be seen today in Millwall Park and is the only tangible evidence of the Millwall Extension Railway. Stepney's Own Railway - A history of the London & Blackwall System by J.E.Connor, Connor & Butler 1984 & 1987 ISBN 0 947699 02 3. 1896 1:10,560 OS Town Plan shows the layout of the station with two facing platforms on the through line to Blackwall and a single platform on the North Greenwich branch. A footbridge spans the platforms and this links to a long bridge across the Harrow Lane marshalling yards to the station entrance at the end of Harrow Lane. The line to Poplar Dock runs over the Blackwall line to the east of the station. The signal box controlling the junction with the North Greenwich branch is seen to the west of the station. Click here for a larger version. 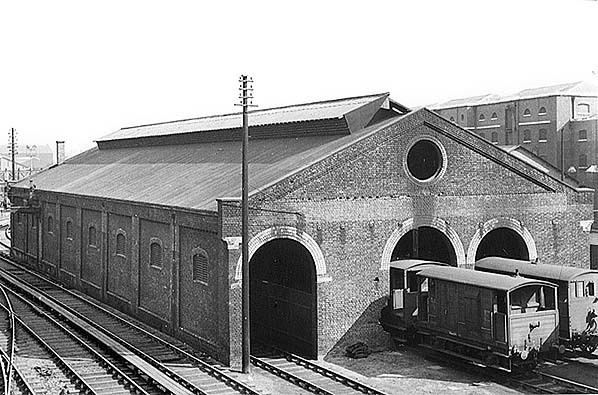 GER engine shed that stood near Millwall Junction station in 1935. It had a mixed history, originally being built as a goods shed by the GNR but taken over by the GER and converted for the 1871 opening of the Millwall Extension Railway. 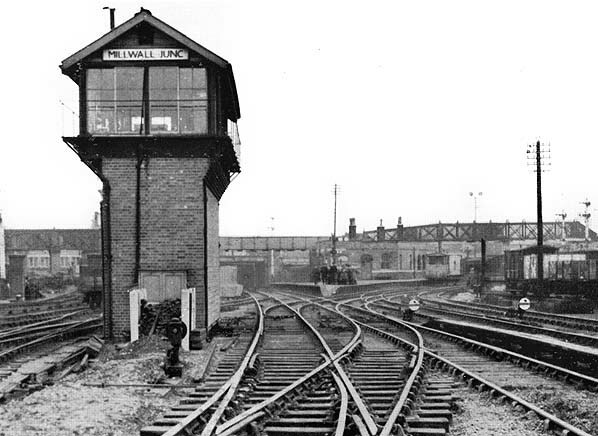 The furthest two roads in the picture were used for engines, while the third was unusually, internally fenced off, for carriage use. Closure came in May 1926, but the building continued in use as a goods shed/stock store, as can be seen. Millwall Junction Station looking east during a visit by the The LCGB (London Branch) Poplar & Edgware Railtour on 5 May 1956. Millwall Junction looking east towards Blackwall during a visit by the The LCGB (London Branch) Poplar & Edgware Railtour on 5 May 1956.